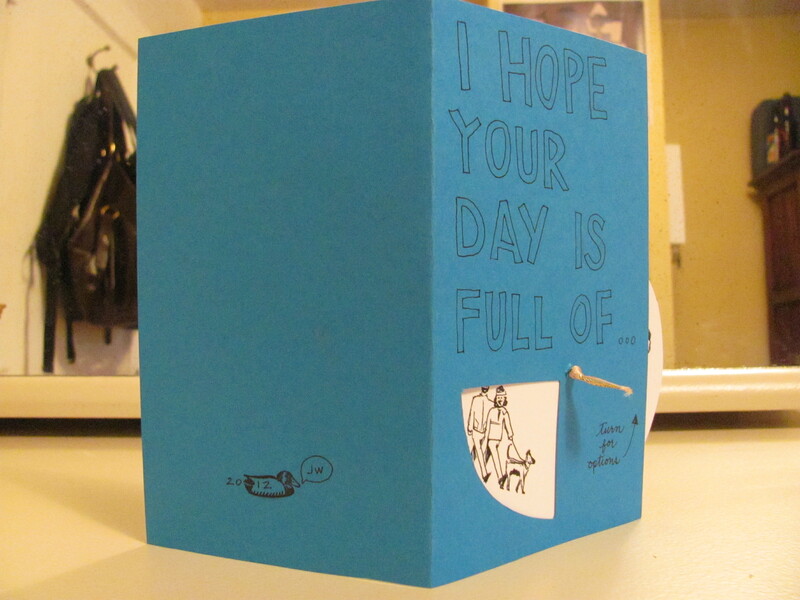 Making your own greeting card brings the intended sentiment up a notch. It makes the medium and the message more relevant to the recipient’s life. Which is why I rarely purchase the standard stationery to send off to family and friends for their once-a-year day of personal celebration. I also think that a card is a great chance to communicate the feelings exactly as you feel them, with integrity. For me, that means placing my stylized ink drawings on a bright piece of card stock with some interactive element. I want the recipient to know I spent some significant time on them. On his latest birthday, I hoped so many things for my dad. The guy loves a cup of hot coffee with a slice of cake. (Carrot, black forest, butter cream — you name it, he’ll take it). He would undoubtedly be hearing from all three of his out-of-town daughters (through some means of telecommunication). His recent passion is for model trains. (You should see the world he’s created in their former guest bedroom. It’s worth me having to now sleep on the couch.) And he’d want to begin and end his day with a relaxed walk with my mom and their pooch, Bryn. I suspected he’d get all these things anyway, so why not capture them all and inspire him to do them every day? When communication is effective, it does more than make people feel good. It directly links to results (says David Grossman over at leadercommunicators). Now, I’m not going to claim that my dad went out and got all these things because of my card. That wasn’t my goal. The goal was to offer a beautiful summary of the ideal day’s events for my dad to reflect upon. It was also a way for my dad to be reminded that someone far away was thinking of him. The actual result? By the time I spoke with him that morning, he had received my card and already heard from both Sam and Meg (by text and by Facebook message). He reported that he was leaving work at noon to go for a bike ride and that there was a beautiful piece of cake from the local bakery selected by Mom and waiting for him to consume (with coffee) after the ride. I imagined Bryn would stick to her routine of squealing upon his arrival home and he’d relent happily to her pleas for a walk. The card sat on the fire mantle a good month after his birthday. I’d say that’s success. A good day, a good card, a good reminder of love. I’ve always loved working with chalk, and using the pavement as my canvas. But turns out this is an illegal act! That’s right, all the creative munchkins out there better not draw outside Mr. Grumpy Neighbour’s driveway unless they want to risk getting the Sanitation cops called on you. Ok, this happened in Brooklyn, not in Vancouver. And it was back in 2007, not today. Certainly Vancouver’s cops have better things to deal with than chalk. Is it safe to assume I’m in the clear? There’s artists around town, such as Jerm IX putting up stencils of his poetry on Vancouver buildings (not his buildings, I assume) using spray chalk. Is his work considered vandalism if it washes away in the rain? Thing is, he’s spraying under bridges and on the sides of walls — places the rain doesn’t easily touch (though, you never know, sometimes the rain hates on us from an angle). So it’s down to the city to power-wash it away, should it so choose. I vote that we don’t wash spray chalk “vandalism” away. Unless, of course, it’s in the form of lame advertising campaigns under my foot. Let’s consider public space as more our space, for us to use and share, not to be dictated and ransacked by Bottom-Line Hungry Advertisers (dear me, here goes my left-wing Communications-degree rant)… More white space, less illegal ads, yeah! Anyway, Crayola certainly isn’t helping pare back vandalizing amongst children when they put out enticing products like 3-D chalk! Sheesh.